Join our Awesome Community Partners for Snow Much Fun! • Snowmobile Demo & Display – Forest Power Sports Ltd.
• Caledonia Nordic Ski club Presents: Try It – Para Nordic Sit Ski with Josh Dueck! Community Kick Start to the Holiday Season! Taking place in Canada Games Plaza featuring live entertainment, music, dancing, activities, holiday treats, crafts, face painting, Wood Wheaton hay rides, a visit with Santa, the lighting of the Canadian Tire Tree of Lights and a stellar fireworks display. Want to kick off your holiday shopping with a Downtown Shopping Prize Package? Come downtown for the Small Business Saturday Scavenger Hunt on Saturday, November 24th. Pick up the Scavenger Hunt Sheet at any participating business, then work to figure out the clues! The Draw for the winners will take place live on the Downtown Prince George Facebook page at 4pm on Saturday November 24th. Head to our Facebook Page for all the details and to see the prize packages! Shop local on Plaid Friday to get into the holiday spirit. There will be carolers strolling the streets, kids crafts at The Hubspace and even a visit from Santa Claus! Shop or dine downtown anytime on Friday, November 23rd to score some free swag. Just bring your receipts to Downtown Prince George staff at The Hubspace between 4-8pm and you can pick up your Love Downtown PG Swag. AND, the first 12 people will score a FREE Downtown Prince George Shovel! Looking for a photo with Santa? We have you covered on that too! Get your photos with Santa, for a minimum $5 donation at The Hubspace. Santa will be there from 5-6pm and 7-8pm. Our professional photographer will take your photo and we will upload it to a album on the Love Downtown PG Facebook Page, that way you can download and print at your leisure. All donations for Santa photos will be going to CPAH, Community Partners Addressing Homelessness. CPAH members comprise of a number of community service agencies, government ministries, organizations and concerned individuals – all working in partnership to end homelessness in Prince George. CPAH aims to promote awareness, educate the public, engage the media, advocate with all levels of government, to collaborate/cooperate most effectively, utilizing resources to provide supports to the most vulnerable members in the community and to end homelessness. Plaid Friday is also the kick-off to the Shop Downtown PG contest. Enter to win anytime you shop downtown this holiday season(November 23 – January 4). Prize details to be announced. Win a FREE lunch! Get your office together and all wear plaid on Friday, November 23rd. Then post your plaid-full office photo onto the Love Downtown PG Facebook to page to be entered to win a lunch (up to 15 people) catered by Sweet Sassy Savoury Catering! And on top of all of this, your favorite downtown businesses will be staying open late, having great deals and even some live music! Stay tuned to our Facebook Page for all the up to date details! With all the construction in downtown PG, you will need to plan a new route to get around, here’s a map that shows routes into downtown, and how to get around the construction. We know that it takes a bit more time right now, but all the upgrades and wonderful work that’s happening will be an awesome addition to your downtown! For all the people taking Queensway, you can turn on 20th or 17th and take Victoria Street into downtown. If you are coming from the other direction, Queensway, you can take 4th or 5th to get you around the construction. And here is a great map for all the pedestrians. Due to air quality concerns, Downtown Prince George has decided to cancel the outdoor Saturday Pop-up Market at the Columbus Parking Lot (2nd Avenue & Quebec Street) scheduled for Saturday August 11th from 10am to 2pm. We apologize for any inconvenience that this will cause to our supportive patrons, but we believe that our vendors should not be exposed to the poor air quality unnecessarily. The next Downtown Pop-up Market is scheduled for Saturday August 25th and organizers will be looking at adding an additional date between now and the end of September. Please watch for more information on the Downtown Prince website (DowntownPG.com) and on our FaceBook page (DowntownPG). 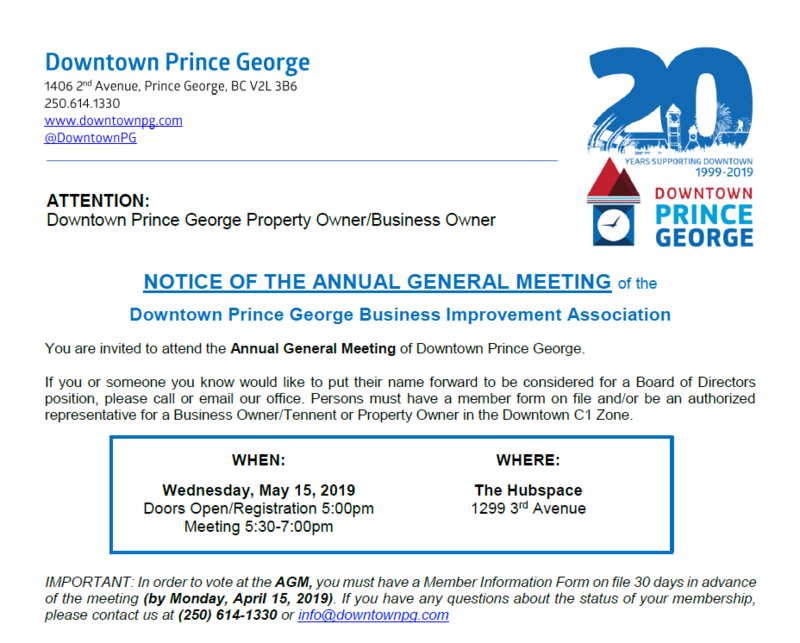 Downtown Prince George Says Thank You! We want to Thank ALL of our Amazing Supporters, people and groups that make Downtown Summerfest the awesome, fun day that it is! Without your continued support Downtown Summerfest would not be possible! The TD Mainstage will be Rocking this year at Downtown Summerfest! Check out the schedule below.